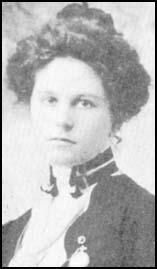 Etta Place was born in about 1878. Little is known of her early life but it is believed she was a schoolteacher before meeting the Sundance Kid. Sundance Kid and his fellow outlaw, Butch Cassidy, decided to start a new life in South America. On 29th February, 1902, Etta Place and the two men left New York City aboard the freighter, Soldier Prince. When they arrived in Argentina they purchased land at Chubut Province. It is believed that Etta Place returned to New York in 1907 to have an appendicitis operation. It is not clear what happened to her after that. One story says she moved to Denver whereas another claimed she returned to South America and was killed, along with Butch Cassidy and the Sundance Kid, during a bank raid in Mercedes, Uruguay.